MERU, Kenya – Ngai Mutuoboro, 70, may not wield the vibrancy of his youthful days, but he can still pack a punch when it comes to environmental conservation. The elder from Tharaka Nithi County in upper eastern Kenya, has been arrested, harassed and even lost a member of his community group, for agitating against illegal exploitation of Mt. Kenya forest by pwerful politicians. At his shanty structure in Kibubua village which flanks the forest to the east, Mutuoboro keeps a collection of documents that show the kind of human rights abuses environmental groups like his, face, when they lobby against politicians involved in illegal logging at one of the biggest water towers in Kenya. Mutuoboro belongs to the Atiriri Bururi ma Chuka community group that has been agitating for the conservation of the forest since Kenya attained independence. But despite such efforts, well financed politicians allegedly bribe the local forestry office to continue exploiting the forest – and to curtail Kenyans like him. Early March this year, three of his colleagues were patrolling part of the forest that is widely deforested, when security officers assailed them. One was shot dead, while the other two sustained bullet wounds in the stomach. “They accused my colleagues of being in the forest illegally yet the Atiriri Bururi ma Chuka is recognized by the government as a community group that lobbies for the conservation of Mt. Kenya forest,” he observes. Mutuoboro’s is just but a pinch, of the kind of pressure environment groups are facing in Kenya, following recent efforts to censure the civil society movement in the east African country. Some, like Mutuoboro’s, have been accused of being community militant groups. More have been accused of money laundering, tax evasion and terrorism. Yet others have been accused of being espionage fronts for foreign powers. The government is even playing the arm twisting card by accusing Civil Society Organizations (CSOs) of failing to account for donor funding. It has led to an attempt to put a 15 per cent cap on all foreign funding CSOs receive. All these accusations are meant to justify the deregistering of targeted civil society groups, according to human rights groups. The resolve to censure the civil society is no anomaly to unscrupulous politicians, but the extent at which it is leaving a rough patch on Kenya’s fragile ecosystem is a glaring anomaly. At the Mt. Kenya forest, a strip of 24,000 acres of land is facing serious politically linked timber logging. In some parts of the forest, aerial images in Mutuoboro’s possession show stretches of land the size of a football field that have been stripped of tree cover. But it is not Mt. Kenya alone that is feeling the sting of the CSOs censure. 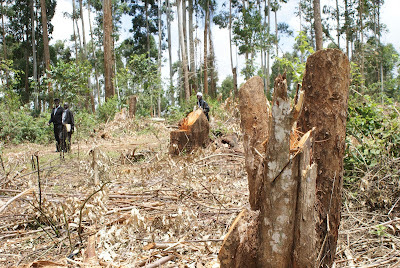 The government has declared its intention to excise some 17,000 hectares of land at the Mau forest. Patches of land in sacred forests like the Kaya in Kenya’s coastal region are being illegally allocated to private developers. “Community forest conservation groups are the most vulnerable to political manipulation because they are not well informed about the law,” observes Harriet Gichuru of Nature Kenya, whose organization has established a payment for ecosystem services in central Kenya to protect the groups. But even with such protection, the civil society has not been spared the political offensive. Lately, hostile groups like the al shabaab have discovered their weakened state and are exploiting it to their fill. In parts of lower eastern Kenya and the northern region where insecurity has left communities vulnerable to militia activity, charcoal burning is stripping the region of its rangeland vegetation. In lower Eastern Kenya alone, at least 12,000 bags of charcoal with a 90 kilogramme capacity are generated everyday, according to the Kenya Climate Change Network (KCCN). The local administration has linked the widespread charcoal burning to poor CSO presence due to insecurity. Its officials also say there is high demand for charcoal by the militia group al shabaab. In 2013, the UN Monitoring Group on Somalia annual report estimated that al shabaab’s charcoal exports to the Middle East could be as high as 24 million sacks per year, netting an overall international market value of $ 360 to $ 384 million. “Eastern and Northern Kenya are potential sources of charcoal due to insecurity and a porous border with Somalia,” says Joseph Ngondi, an official with KCCN. In January this year, the US and Kenya governments signed a Memorandum of Understanding (MOU) to help the eastern Africa country fight environmental crime. The US Secretary of the Interior, Sally Jewell, while officiating the signing of the MOU said part of the agreement would improve technology in surveillance to reduce crimes like charcoal trafficking. “Land cover and satellite imagery is very helpful when it comes to understanding what is happening with illegal logging and deforestation for whatever purposes, whether it is for the export of lumber or charcoal,” said Jewell. But such advances in technology may not fix the civil society’s jinx, argues George Awalla, the head of programmes at VSO Jitolee, Kenya. In Awalla’s view, CSOs are established for a purpose, which is largely to take sides with those who are poor and marginalized. According to him, CSOs should stay true to the humanitarian narrative, although there could be some that may be flipping their roles. “The foreign powers also have interests in what happens within Kenya for selfish reasons and also because they know that if they can infiltrate this set up then they will divide the voice of the citizenry,” argues Awalla. According to him, the Kenya NGOs Coordination Board (KNCB) needs to continue being vigilant to ensure that there are mechanisms in place to weed out CSOs that are suspected to be doing espionage or supporting some activities that are not acceptable within the society set up. “There should be transparency and honesty in these matters so that we do not have a vendetta and pick it through the whole mechanism of coordinating CSOs,” he says. At the KNCB, it is unlikely that a visitor will be treated well by the General Service Unit officers who keep sentry there. On a normal day the Board receives thousands of clients seeking for services. Scola, an official who works there says the Board’s mandate is to register CSOs. But she also says there is an investigative department which keeps vigil on rogue and genuine CSOs. In the few years that she has worked there, she says, the investigation department has deregistered a few CSOs for allegedly being involved in questionable activities. The Kenya Parliamentary Committee on Environment, Water and Natural Resources is cautious to deny or acknowledge there could be CSOs in Kenya involved in questionable activities. But its chairperson, Amina Abdallah, argues that the 2013 Public Benefits Organization Act (PBOA), which among others, recognizes the establishment of CSOs, protects genuine civil society movement in Kenya. That may appear like a farfetched possibility to peasants like Mutuoboro. According to him, community conservation groups are at their lowest point in Kenya. But Ikal Angelei, the founder of the Friends of Lake Turkana CSO, argues a legislation, like a Climate Change Bill, would place conservation and environmental groups at their perch. By her estimation, a climate change policy would ensure that the development and interventions that the government, both National and County make, would take care about the communities’ engagement in conservation. For now, it will take real government’s intervention for voices like Mutuoboro’s to be heard. But if past patterns are anything to go by, the politician’s might, may carry the day. And Mutuoboro, just like many other marginalized Kenyans, will continue to voice communities’ expectations on how their resources should be managed.